Manchester City: Who should stay and who should go? Manchester City's heavy loss to Manchester United in the derby at Old Trafford on Sunday was further evidence of the decline suffered by the reigning Premier League champions this season. Instead of defending their title they are now thrust into a battle to ensure they remain in the top four places to secure Champions League football next season. If Liverpool beat Newcastle United at Anfield on Monday they will close to within four points. Irrespective of how this season ends, City's ageing squad is in need of a serious overhaul and speculation continues to surround the future of manager Manuel Pellegrini. So who should be in or out at the Etihad next season? Caballero was very much Manuel Pellegrini's man as a signing to understudy Joe Hart, having had him at Malaga. The Argentine keeper is unlikely to see a great deal of active service barring injury - so could make the cut as a dependable second in line to Hart. Did you know? Caballero conceded two goals in each of his two appearances yet still ended up on the winning side in both games (Sunderland and Hull). Not at his best against Manchester United but England's goalkeeper has maintained his form this season while others around him have lost theirs. If, as expected, City reconstruct their squad this summer, Hart will surely remain as a centrepiece in the future. Did you know? Hart has played more minutes in the league (2,700) than any other player in the City squad this season. Once a fine player with a good attitude but past his best and City need to do better at left-back if they are to reboot and challenge for major honours next season. Verdict: Fine as a deputy but not first choice. Could be the summer to make a change. Did you know? Clichy has the best success rate of anyone to make 50-plus tackles at City this season, 81%. Much derided at the start of his City career but has been their best defender this season - age may count against him if they decide to give an ageing squad a fresh look. Verdict: Done well for City and no hurry to rush him out of the door but hardly a long-term bet. Did you know? Demichelis has made a team-high 131 clearances in 2014-15. Now very much a peripheral figure and hard to see how he would seriously play a part in any long-term strategy. Did you know? Kolarov is yet to score a goal this season, he has scored at least one in each of his previous four campaigns with City. The club's inspirational leader and captain has had a poor season punctuated by injuries and loss of form that has revealed a vulnerability that has not been in evidence before. Kompany, however, may benefit from a summer without football following a hectic schedule, including the World Cup, and City will hope a period of rest can restore some of his old powers. Verdict: Too early to call time on a quality defender and personality. Will still be around next season. Did you know? Kompany has been booked more often (seven times) than any other City player this season. Desperate disappointment after his £32m move from Porto. The central defender has looked ill-at-ease and unsuited to the rigours of the Premier League - one of the signings who pose questions over those making the transfer decisions at the Etihad. Verdict: Does not look up to the job and cutting losses could be wise but who would take him at anywhere near a price City might accept so soon after paying such an astronomical fee? Did you know? Mangala has completed 94% of his passes in his own half this season, the best rate by any City defender. Sagna is nearer the end of his career than the start and is on a three-year deal after making a free transfer move from Arsenal. He has been trusted by Pellegrini in many of City's big games in the Champions League but younger options may be sought. Unlikely to be a regular next season but could still be of use - and would he get a better deal elsewhere? Verdict: Hardly one for the future but could survive as a squad player. Did you know? Sagna has made just nine Premier League appearances in his debut season with City, winning just four of those games. Not a vintage year for the Argentine right-back who has been one of City's outstanding performers in recent years and is a hugely popular figure with their fans. Zabaleta is made of stern stuff and will be determined to put matters right next season and prove he has not passed his peak. Verdict: In the same category as Kompany. He has been of such importance to City in their years of success that it would be rash to cast him aside after one indifferent season. Did you know? Zabaleta is the only outfield player for City to make more than five appearances and not be either subbed on or off this season. Not a spectacular player but reliable and certainly counts as someone worth having around in the squad. May not be so effective against the truly top-class European opposition but worth keeping. Verdict: Should still be part of plans next season. Did you know? Fernandinho has contested (347) and won (173) more duels than any other player at the club this season. Another poor signing at £12m from Porto. Looks sluggish and seems to be allergic to a forward pass. What has he brought - or was meant to bring - to City's team? This is a question that has not been answered. Verdict: Out if a buyer can be found. Did you know? Fernando has a 62% win rate this season, but when he has not played City have a 46% win rate, winning just 5 of 11 when he has not featured. Excellent, under-rated player but could well be on his way out at Manchester City after no deal has been agreed on a new contract. A manager's dream and there will be no shortage of takers should he move on. Verdict: Should be kept - but looks increasingly like he will not be. Did you know? Milner has been involved in nine goals this season, a personal record for him at City in a Premier League campaign. The odd contribution apart, this has been a season of under-achievement for a gifted individual who should contribute so much more than he does. This has mirrored City's season and it may be patience has run out. Verdict: Served his purpose at City and would not be a huge loss if a good fee can be recouped. Did you know? City have had a 59% win rate when Nasri has played this season but just 50% when he has been absent. Highly prized on arrival from Sevilla but has failed to deliver on his promise. The statistic of 30 Premier League appearances this season and no goals is damning. Verdict: Could be in danger if the right offer comes in. Now 29 and will not get any better. Did you know? Navas has made a team-high seven assists this season in the league. The big dilemma - the driving force behind City's years of success but has looked laboured, jaded and occasionally disconnected this season. He has looked a shadow of his former self. He has also failed to impose himself when City have needed him. No-one should ever under-estimate what he has done for City but the time comes for everyone and it may have come for Toure. Verdict: If a club such as Inter Milan offer a decent deal, time to sell and move on. Did you know? Toure has made more touches (2,456) than any other player in the squad this season, ranking fifth league-wide in this category. Maybe not quite touched the previous heights this season but still a magical footballer capable of making decisive contributions. A player and personality who has graced the Premier League and will continue to do so. Did you know? Silva has created 77 goalscoring chances for his team-mates this year, the most at City and only Eden Hazard and Cesc Fabregas have created more in the entire league. World-class, despite a failure to produce his very best after picking up a knee injury in December - something that hit City hard. Aguero is as close to a guarantee of Premier League goals as you can get and is crucial to everything City want to achieve. Did you know? Aguero has attempted more shots (93) than any other player in the league this season. Brought from Swansea City to give Manchester City extra cutting edge but has made a slow start then picked up an injury. 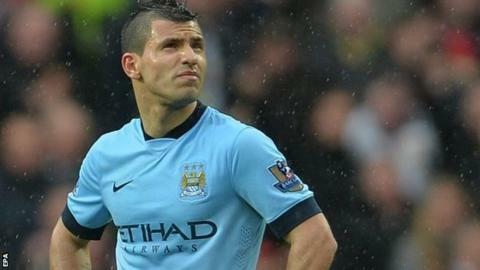 He has, however, proved his Premier League pedigree and City will expect to see his best next season. Verdict: Part of the future. Did you know? Bony has played just 219 minutes for City this season, making just two starts and not completing 90 minutes once. Miserable season for the Bosnian whose goals did so much to bring the title to Manchester City - just four in 21 Premier League games reflects his poor form. The decision to bring in Bony for £25m from Swansea City was perhaps an admission of Dzeko's decline and reduced impact. Evidence suggests City have had his best years. Verdict: May just have outlived his usefulness at the Etihad. Did you know? Dzeko has just four goals so far this season in 21 appearances, his last three seasons saw him score 16, 14 and 14 goals respectively. He is a gifted Montenegrin who has shown quality in flashes but nowhere near often enough. Lacks consistency and is another big buy who has to be classed as a failure. Verdict: On his way out. Did you know? Jovetic has been involved in a goal every 98 minutes for City (five goals, three assists, 787 mins), only Aguero and Frank Lampard have a better goal involvement rate for the club. A season of disappointment for the manager who brought the Premier League and League Cup to Manchester City in his first season - which means speculation about his future is now inevitable. If City, as is still a prospect, finish outside the top four then it is impossible to see how he can survive after such investment in his squad. And if City could somehow lure Bayern Munich coach Pep Guardiola to the Etihad he would also be in peril - no huge appetite for change as yet but his prospects were not helped by the manner of City's capitulation against Manchester United. Verdict: On thin ice. Uncertain times. And who might City bring in? Operating on a money-no-object wish list, here are three players Manchester City might love to add to their squad. The brilliant France midfielder is the one who got away from Manchester United - and it could take £60m to prise the 22-year-old away from Juventus. Powerful, skilful and driven, he would be the perfect addition to a City midfield that has looked pedestrian this season. Complication: If Juve show any inclination to sell, an orderly queue will form, probably including Real Madrid and possibly even Manchester United. Just the sort of young English statement signing that Pellegrini says City are looking to make. He would add pace to City's attack and be a creative force. Complication: Despite an increasingly messy and public contract impasse, Liverpool insist he will not be sold this summer. And when Liverpool owner John W Henry said the same with Luis Suarez in 2013, he was true to his word. The sort of signing that would tell the football world Manchester City mean business. For all his supposed struggles at the Bernabeu, a world-class talent. Complication - Real insist he will not be sold and Bale has expressed no wish to leave but things change by the hour at the Bernabeu. Also Bale has constantly been linked with Manchester United should he return to the Premier League. Chelsea would also show an interest but City could match any financially.